DETAILS: Take in the beautiful white sand beaches and turquoise water on the highest point on the gulf in Blue Mountain Beach. This 2220 sq. ft. condo is just steps away from the pool and beach access. You will have access to the infinity edge Gulf front pool, or the three-tiered pool close to the unit. 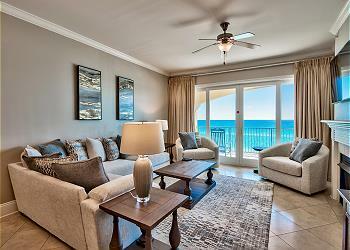 Relax on your patio or enjoy your spacious living room with breathtaking views of the Gulf of Mexico. This adagio unit comes with two parking spaces. Check availability and book with 360 Blue today. 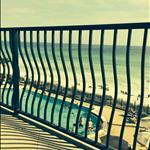 We are so glad that you enjoyed your stay with us in Blue Mountain Beach at Adagio! We agree that this condo is a wonderful option for a fun beach getaway and we hope to host you again soon! We are so glad that you enjoyed this property while in town. We apologize for Red Tide and we hate that Hurricane Michael cut your stay short! We hope you are able to join us again soon and hopefully for a much longer stay this time! I really liked the condo and it had everything needed! It’s a great loacation! They were great about accommodating allergies. The only problem it had was mildew in the bathroom shower and hall tub. I didn’t complain because I didn’t want to deal with amy chemical smells and it wasn’t bothering us. I know it’s hard to control with all the humidity. The beds were really comfortable and it was a relaxing place! Loved it! We are so delighted that you enjoyed your time with us in Blue Mountain Beach! We agree that these condos are in an amazing location and has so much to offer! We thank you for your understanding and your valuable feedback regarding the mildew in the bathroom. We will share this with our team to get it taken care of right away. We hope to see you all again very soon! Exceptional condo and location. Our only issue was a dirty unit. I personally did quite a bit of cleaning. The refrigerator interior , floors and furniture were all dirty. There was candy and debris scattered in the bathroom. I requested 360 send someone to sweep and mop the floors. The 360 staff was accommodating. We are so pleased to hear that you enjoyed your vacation even with the bumps in the road you experienced. We are glad that you had a great experience with our team, however, the lack of cleanliness is not the 360 Blue standard. We are glad that our cleaners went back to accommodate you and we appreciate your valuable feedback. We hope we are able to assist you again soon! Beautiful unit. We had a great time. Thank you for choosing 360 Blue. We hope to see you back soon! Beautiful beaches, amazing pools, fantastic accommodations! Our family had the most amazing and memorable vacation staying here. We could not have asked for anything more. The 360 company was efficient, extremely helpful, and very communicative to make the trip flawless. The one thing we weren't prepared for was the need for spices and kitchen linens but that didn't affect the amazing time we had. The floors left a black film on our kids feet and socks. Thanks for a beautiful week in Santa Rosa! What a gorgeous group photo! We are so delighted to hear that you enjoyed your stay with us so much! Thank you for choosing 360 Blue for your family's beach vacation. We have passed your suggestion for spices and more kitchen towels to the property manager for future visits. Thank you for taking time to share your valuable feedback! We hope to see you all back at the beach again soon! Sandcastle kids arranged for my family to have a week stay here in Santa Rosa. I am so very thankful for this extraordinary opportunity. I have never enjoyed a vacation as much as I did this. My son had brain cancer last year and we lost his father in the process of therapy. These beaches and scenery and the amazing condo we had the pleasure of using was just a dream come true. Thank you for this week. My favorite part of the trip was when we made art from shards of glass At the Shard Shop. I'll include a pic if I can. Thank you all for this much needed vacation! I won't ever forget Santa Rosa! What a precious work of art! It's definitely something to treasure for years to come! We could not be more thrilled to hear how much you enjoyed your visit with us in Blue Mountain Beach. It really is the perfect community for a quiet getaway. Thank you so much for choosing us for such a special trip, and taking a moment to share your experience with us. We hope you'll be back to visit us again soon! We are so happy to hear that you enjoyed your stay with us in Blue Mountain so much! Adagio really does have some spectacular views! Thank you so much for choosing 360 Blue for your family's beach vacation and for taking a moment to share your experience with us! Be sure to visit again soon! We had a great time at Adagio! Condo was great! Beach was so pretty and clear. We could see the bottom of the ocean no matter how far we went out. We loved the pools. The only issue we had was the handrail going down to the beach was hard for the older people (mid 70's) to hold onto. It was too large (wide). That did not take away from the great vacation we had. We hope to return! We are delighted to hear you enjoyed your stay with us so thoroughly! Thank you so much for taking a moment to share your experience with us. We are happy to hear you could spend some time on our beautiful white sand beaches, we really do have some of the best beaches! Thank you for your feedback in regards to the handrail, we will pass the information along! Thank you for choosing 360 Blue for your family's beach vacation. We hope to see you back at the beach soon! Great property at Adagio!! It was perfect, loved the pools and terrific access to the beach too! 360 Blue is the best property management company in the area! Thanks! What an incredible photo! Thank you so much for the kind words. We are thrilled that you had such a wonderful stay and we look forward to having you back soon! 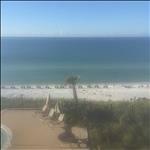 Loved our stay at the Adagio! Beautiful condo even better than the online description. Had an appliance break while we were there and maintenance fixed it very quickly! Great location, great condo! Highly recommend it to anyone! We are so thrilled that you had such a wonderful stay in this amazing condo. We hope to have you all back soon! 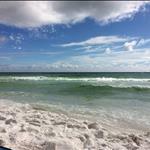 We have stayed on 30a many times and this was our first in Blue Mountain - we loved it!!!! The unit was very spacious, such easy access to the beach which was great for our little ones. Very tastefully decorated, everything we needed was there. We had never considered renting bikes in the past but really loved that the unit came with them. Riding down to Blue Mtn creamery became a ritual in the evenings! And the pics don't do justice to the fabulous pools! We will definitely be back! My family had a great time!! Condo and beach were wonderful! Our first time to this area. Staff was friendly and helpful. So much fun! This picture is adorable! We are so glad to hear you enjoyed your vacation and loved the area! Thank you for choosing 360 Blue and for taking a moment to share your experience with us. Hope to see you again next year! Loved the stay! The only negative thing i have is that the carpet is realky dirty , needs replaced!! A big tear in be bedroom!! Otherwise really enjoyed and probably will be back!! What a gorgeous view! Thank you so much for the valuable feedback. The carpets are currently being deep cleaned and the tear will be fixed within the upcoming weeks! Thank you again, we look forward to having you back! 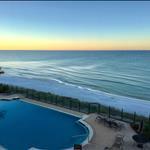 Beautiful condo and beautiful location! Our family had a great time! Looks like a perfect beach day! We are so glad you chose 360 Blue to help plan your family getaway and hope to have you back soon! Incredible view! Thank you for sharing! Looks like a perfect beach day! The view here is definitely amazing, we're so glad you chose to stay here! Our reservations team would be happy to plan your next visit for such a special occasion! Thank you so much and we will see you soon!